Are you a CMO? 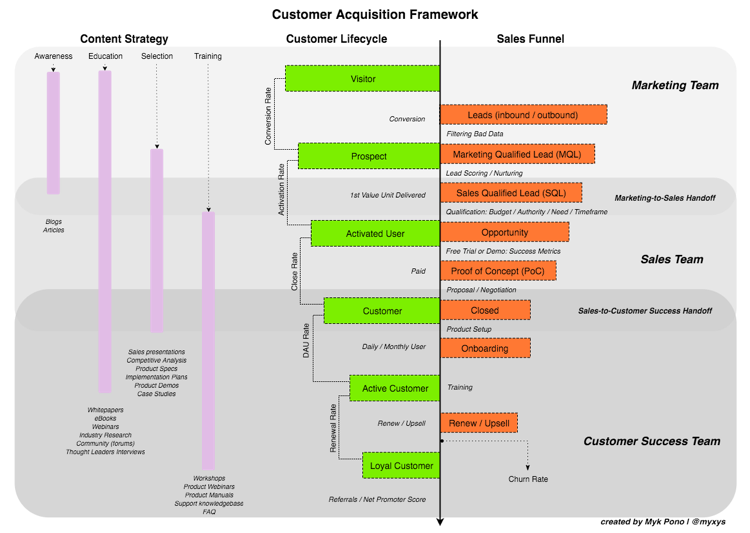 When was the last time you invested money into Customer Acquisition? Today? When was the last time you felt confident spending one dollar because you’d get back 10 dollars? And I’m not speaking about extrapolating LTV. I’m speaking about real LTV on a specific customer. This article will give you all the solutions to help you measure Customer Acquisition and compute your Customer Acquisition Cost (CAC). 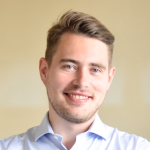 Why should we track Customer Acquisition? Customer Acquisition often takes up most of your Marketing budget. It’s important to know how you’re doing to adapt your strategy. It’s primary that you measure progress to avoid going off-course and metrics are a good proxy for progress. Tracking Customer Acquisition allows for a better control of your spending and makes sure you’re being profitable on specific channels. To give you a quick example, we started writing answers on Quora with one of my customers. We quickly noticed leads were pouring in. Awesome, right? After carrying out more research, we realized these leads weren’t converting and Quora wasn’t worth the investment. It’s easy to see leads come in, it’s a little harder to consider the full-funnel and see if these leads actually convert to paid customers (which is what really matters). Easy question: Why would you put money in a channel that doesn’t show a positive ROI? This article is all about telling you how to track that and the different solutions at your disposal. Quick disclaimer: Branding effects being very hard to measure, I won’t get into much details about them. (e.g. It’s easy to see Quora driving a lot of eyeballs but if we can’t measure the impact, that probably shouldn’t be run by the Growth Team). Your business is very different from others: You can’t always rely on “template metrics”. HubSpot realized most sales were closing at the end of the month. Churn of the sales closing at the end of the month was higher. By implementing the CHI score, HubSpot was able to align Marketing, Sales & Customer Success on one metric. How valuable could it be to understand how different channels behave when considering the CHI score for HubSpot? For the little story… HubSpot hypothesized that these sales were closed because sales people were using aggressive tactics to meet their quota. The CHI score made sure sales people weren’t too pushy on their leads. Back to business. You need to define your own metrics. To help you out, Myk Pono wrote a great piece on how to define your metrics to track Customer Acquisition. From what I’ve noticed, most companies rely on first / last touch attribution. Although they’re the simplest attribution models on earth, they fail to depict the entire customer journey. With this scenario, Google AdWords will get absolutely no conversions. Does that mean you should stop Paid Advertising? The attribution model you choose should be tied to your objectives. If you focus on Awareness, choosing First Click can make sense. If you’re focused on Customer Acquisition (like most startups), you should probably go for a model that depicts the entire journey (linear, position-based). Content is awesome for Brand Awareness but we need to do some Retargeting if we want to increase website conversion rates and improve our results. If you want to learn more about Attribution Models, check out this article by Avinash Kaushik: Multi-Channel Attribution Modeling: The Good, Bad and Ugly Models. It’s important to look at the Channels bringing traffic. It’s equally important to look at what people are doing on your website. To give you an example, if you notice that Google Search is an awesome channel for you, where is that traffic landing? It could come from your blog or branded search terms. In one case you’ll focus on getting more high-quality content out there, on the other you’ll focus on brand awareness. Without diving a little bit deeper into the data, you won’t know how to impact it. Please note that I won’t get into the details of how to track links through UTMs. I’ll focus solely on the stack that you need in order to correctly track Customer Acquisition at a SaaS company. Having a Data Warehouse means having all of your data easily accessible from one database. Having access to the raw data is awesome because you can do whatever you want with it: you aren’t limited by a specific software. Fortunately for you, we’re not in 1995 anymore; a few companies took the pain out of developing all these integrations. 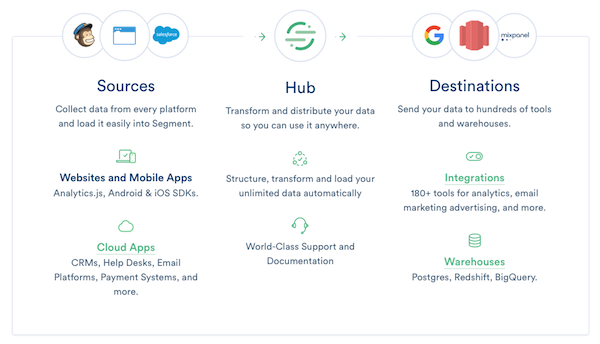 Companies like Segment or Fivetran allow you to connect all your software and push that data to a unique database. 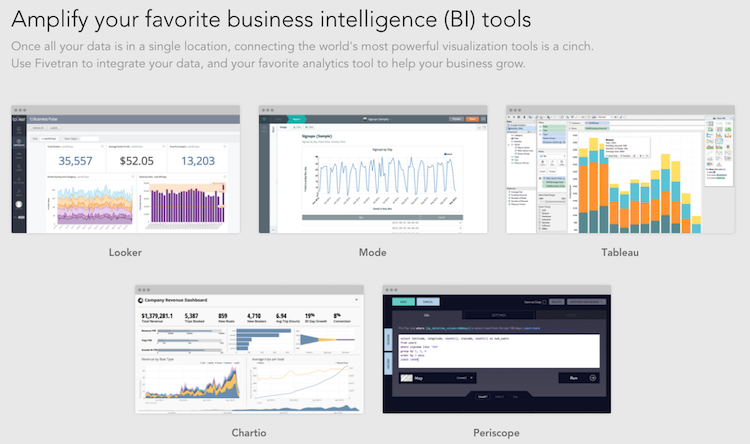 Here are a few links: Looker, Mode, Tableau, Chartio, Periscope. You can find more Business intelligence software on my page SaaS Marketing Tools. Depending on your size, I’d probably encourage you to Buy and not to Make a BI tool for yourself. They often get bloated and lack attention because they take away ressources from the product side. Although these tools can be expensive, if you’re doing $70k+ in MRR, they’re totally worth the cost given that they should help everyone take better data-driven decisions. However, unless you have some developers with free time (that doesn’t happen, right? ), you’ll most likely need an analyst to make sense of that data. On that last point, expensive doesn’t mean that it isn’t worth the investment. If you’re reluctant, start pushing data to a warehouse and invest in a BI tool later on when you feel the need. Google Analytics is the most well known Analytics software on the planet. It’s great to see what people are doing on your website but it can be hard to configure for SaaS businesses. This is mainly because the sales cycle is longer than the session duration. If you’ve configured a “Paid Customer” Goal into GA, most of your conversions come from Direct or Email Traffic and not the initial channel that led to a conversion. Tracking LTV into GA as a Custom Metric but it won’t be as flexible as having your Data Warehouse. Correctly setting up correctly GA on SaaS applications isn’t easy so I’ll probably write an article on that later on. GA works great with Google AdWords. If you want to have other costs into your reporting, make sure to check out Funnel.io. It will allow you to bring data from multiple datasources (e.g. Facebook, Bing) directly into GA.
HubSpot – the Inbound Marketing solution of reference – has some features that can help you track Customer Acquisition. It’s quite flexible but you might have to do quite a lot of work to prepare your data and make it look meaningful. Doing this work is no easy task and requires working with Workflows and other tools. This solution is awesome if you’re part of the ecosystem. Your website runs on HubSpot. You use HubSpot as a CRM. You have integrated it with your APIs. You’ll get great data. On the other hand, if your website runs on WordPress and you use Pipedrive as a CRM, you may struggle to make everything work. Finally, it’s an awesome tool but it’s also simplistic. After all, HubSpot isn’t an analytics company. When you eat and drink data, you will miss a few things. Open up an Excel or a Google drive and start gathering your metrics. It’s probably the simplest solution but also the most time-consuming. It can be a good solution when you don’t have the ressources (mainly money & time) to invest into other solutions. Pay close attention to the metrics you gather because each and every one of them will take you time. I’ve seen people gather more than 30 metrics. They spent an entire day gathering that data every week. What a waste of time when you know that only 5-6 of them were actually useful and actionable. Having a Data Warehouse and a BI tool from day one is realistic, but is this really where you should be spending your time? What happens in most businesses I know is that they’ll wait until data becomes a liability in order to start investing in it. I wouldn’t advise you to wait until it’s a liability but you shouldn’t live in a huge house if it’s only you and your dog. Know where you stand and choose the right Analytics Stack for your needs. Very interesting post Pierre. It’s a bit too early for my own project since we haven’t had enough traction yet, but i’m definitely keeping it for later. As a bootstraping startup with very limited budget, I started gathering events into several tools, and finally I’m mainly using Mixpanel to get all my data reported. However, I’m missing the acquisition channel, and should probably add it somehow (from my backend to mixpanel). Your post inspired me to do that… we’ll see if I manage to achieve that. Thanks for the kind words! Mixpanel has an interesting article on the subject that might help you. Short and concise content. However, it clears the doubt that qualified visitors matters not only traffic. Do you recommend some platform (SaaS) or areas where I can engage or contribute to get targeted customers? Qualified visitors is definitely more important than traffic itself. I’ve seen companies with 1k visitors do much better than companies with > 30k of visitors. 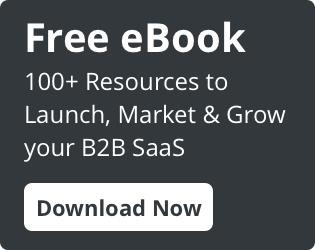 It’s hard to give you insights as to where you could find quality traffic without knowing more about what you have to offer but I’d recommend reading: SaaS Directories and 20 ways to communicate about your startup for free. Very well done on the article, touches on several pain points but clearly outlines the benefits of those as well. I’d be curious to hear more on your thoughts o the manual excel process many marketers endure but hate to do. I know there are a couple BI tools out there but eliminating manual optimizations and excel reports has to be near for marketers. Thanks for your comment! It’s a very difficult issue… As I mentioned in the article, every company is different and it’s difficult to create one size fits all solution. Companies who offer some kind of customization (e.g. BI tools) can be difficult to customize without an analyst. I do believe that the end is near for manual Excel reporting but I still believe that there are some issues within the space at the moment. Hope it helps!